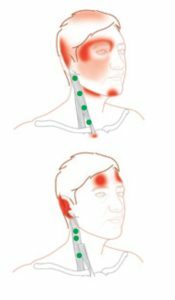 Tension headaches – a pain in the neck! 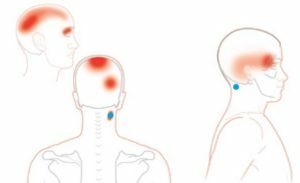 If you suffer from tension headaches (and chances are you do as they are reportedly the most common type of headache) then you will already be all too familiar with their annoying, vice-like nature. For those lucky few that don’t get graced with this delightful condition let me explain – tension headaches can feel like a vice around your head. The pressure can creep up from the back of your neck, the base of your skull, top of your head, to your forehead, temples or around your eyes. And if you’re REALLY lucky – you’ll get them in all of those areas at once. Fun times! Usually these guys are not as severe as their evil brother, the Migraine. Although sometimes tension headaches can be pretty bad there are some tell-tale differences between the two. For example, migraines typically affect one side of the head, produce more of a throbbing, pounding like pain, create visual disturbances or light sensitivity and can be accompanied by nausea. Tension headaches, on the other hand, will usually be felt on both sides of the head, feel like a dull ache or pressure and are not accompanied by sensitivity to light or nausea. Once in full flow, a migraine will stop someone in their tracks and they will not be able to continue daily activities, while tension headaches will usually allow the person to muddle through the day with some mild to moderate discomfort. Of course if you are getting any kind of headache and are unsure of their nature or type it is always a good idea to talk to your doctor. If you are unaware of what triggers your headaches it is a good idea to start a diary. And no I don’t mean you should run out and buy an expensive leather-bound journal and start recording your every move and thought. But just quickly making a note of when your headache starts, the location of the pain and perhaps what you were doing/eating prior to its onset can be a great help in identifying the cause. I use the notes app on my phone – its easy and unfortunately I always have it with me these days 😉 This can be a useful tool for any symptoms you may be experiencing – whether for digestive issues, changes in mood, muscular and joint pain or anything you want to get to the bottom of! Anyway, so why am I writing this blog post? Because massage therapy can be a safe and effective tool in treating tension headaches. Many people will reach for pain killers to relieve headaches – and yes this works in the short-term but if the problem keeps coming back it’s not fixing the cause of the issue and can even be detrimental to your health. Yes – over the counter pain relievers that seem harmless have been proven to cause other health problems with prolonged use and excessive dosage. For more information on this please click HERE or HERE. So next time you reach for a pain killer perhaps seek out alternative, natural treatments and see if they can help instead. If a headache referral is known, the therapist can focus the treatment around those muscles, using different hands-on techniques to ease the tension in the tissue and diminish the pain referral. 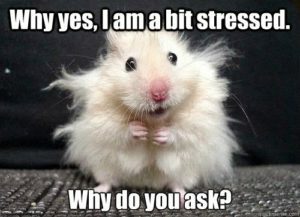 Of course learning how to avoid placing unnecessary stress on these muscles in the future will play a part also; a stretch or strengthening exercise could be all that’s needed to prevent the headaches from returning. Not only will massage help to improve the health of your muscles but it can also reduce symptoms of stress and promote whole-body relaxation. This in turn can assist in getting rid of these headaches for good without the use of regular medications. ← What is an RMT?